Of the dozens of superstars signed to WWE, none have a story quite like Eva Marie. She hasn’t had much success inside the ring, but she’s quickly becoming one of the company’s biggest names outside of the world of professional wrestling. Eva, who goes by the name Natalie Eva Marie, got her start with WWE in 2013. Signing a contract after a WWE Diva Search, she soon joined the cast of “Total Divas” on the E! Network, doing so before even making an appearance on WWE TV. Three years later, Eva is a reality TV star, landing movie roles and selling her own line of clothes. It’s certainly not unheard of for professional wrestlers to make the transition to movies. Dwayne “The Rock” Johnson is the biggest example, going from the No. 1 superstar in WWE to the No. 1 actor in Hollywood. John Cena is currently WWE’s top star, and he appeared in movies “Trainwreck” and “Sisters” last year. Wrestlers like The Miz and Randy Orton have starred in movies produced by WWE. All of those wrestlers achieved success in WWE before branching out, however. While Eva is doing it a little bit differently, she still has the same end goal in mind. Crossing over into the mainstream for a wrestler is easier said than done, though Eva is already making her dream a reality. After hiring the same manager and agent as The Rock, Eva has landed roles in two movies that will be released in 2017. 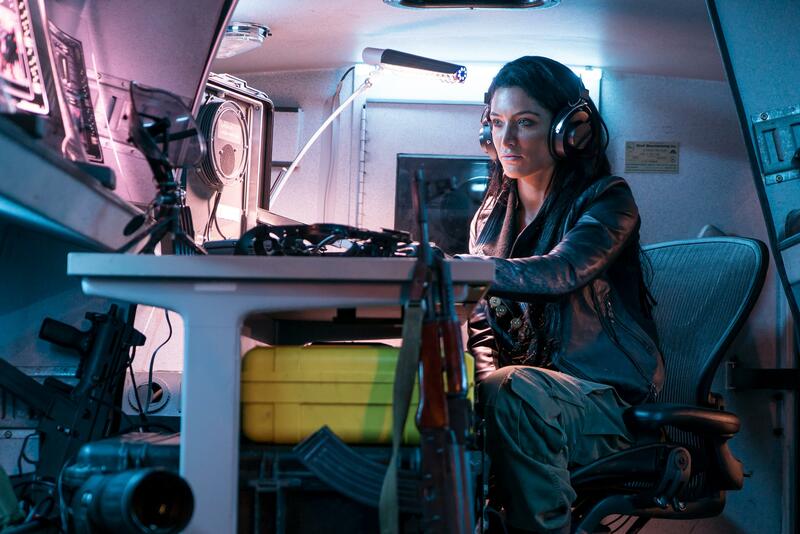 Natalie Eva Marie plays a bounty hunter in “ACTION #1,” which is scheduled to premiere in 2017. Photo: Awesomeness FIlms Wrapped last month, “Inconceivable” will star Eva alongside Nicolas Cage, Gina Gershon, Nicky Whelan and Faye Dunaway. Wasting no time when production on the thriller ended, Eva headed straight to Vancouver where she’s currently filming “ACTION #1,” playing a completely different kind of role: a bounty hunter. Eva has even created her own clothing line, NEM Fashion, which launched this fall. “I really wanted to create something that not only was affordable, but trendy and feels good,” said Eva, who will donate a portion of the line’s profits to her NEM Foundation, which promotes self-love and positive body image for women. Before she joined “SmackDown Live” in July, Eva was uncertain if she'd have a permanent place on WWE TV, even though she had a match at WrestleMania 32. Her quest to become a regular on the show is featured in the new season of “Total Divas,” which aired its first Season 6 episode on Nov. 16. The new installment follows Eva, as well as several other female wrestlers, as they perform in WWE and prepare for the upcoming WWE Draft. As she wraps up filming on her second film, there is no question regarding what’s next for Eva. She’s heading back to WWE and is looking to prove that she has what it takes to become a top female wrestler. WWE’s women’s division has undergone a massive change in recent years, even since Eva got her contract with the company. Formerly referred to as “Divas,” much more emphasis was placed on their looks than their in-ring ability. Now, members of the women’s division are simply called “superstars,” and their ability to put on quality matches has become the most important aspect of their profession. Wrestlers like Charlotte and Sasha Banks, who highlight the women’s division on “Monday Night Raw,” are among the company’s top in-ring performers, no matter their gender. They recently fought in the main event of a WWE pay-per-view, something that no females had ever done in the history of the company. Eva might not be able to do what the likes of Charlotte and Sasha can in the ring, but she’s confident that she can hold her own against the best women WWE has to offer.